Late in the third quarter, the Nuggets were close to overcoming the 19-point deficit the Spurs had put them in just a few minutes earlier. Thanks to the efforts of Malik Beasley, Denver had whittled the lead down to six with about 1:30 remaining in the quarter, and San Antonio was forced to call timeout. Nuggets coach Mike Malone then made a move that seemed like an instant run-killer at the time: he put Jamal Murray back in the game. Up until that point, Murray’s performance had made his numbers in the regular season look fraudulent. He missed all seven of his shots from the field and was sitting with a measly three points when Malone told his star guard to take a breather from his misery. Things didn’t get much better when he returned to the floor as the Denver crowd barely seemed surprised when his first shot back—an ugly contested layup—rimmed out. But once the buzzer to start the fourth quarter went off, it was as if the previous three periods had never happened. All of the hopeless attempts that the Nuggets guard put up were finally falling. Yet Murray didn’t change his shot selection, Malone never tweaked his game plan nor did the Spurs’ do anything to their defense. The ball just started going into the hoop again and it was all Murray needed to return to form. The rebirth of Murray’s scoring abilities galvanized Denver into making deeper and deeper cuts into San Antonio’s lead before eventually getting over that hump. As the clock began to wind down more and more, Murray started to take bolder and bolder shots to put away the game. Attempts that would have been met with groans less than an hour earlier were met with the expectation that the ball was going through the net. It’s safe to say that Murray delivered—once at the end of the shot clock, and once in transition. As for what specifically started this scoring spurt, Murray told Dennis Scott after the game that it was simply his teammates and coaches telling him to keep being aggressive with his shots and not give up. That’s kind of wild to think about given the circumstances! Had Murray continued his slump on that advice, Denver would have likely gone down 2-0 in the series against a team with one of the best home postseason records in NBA history. 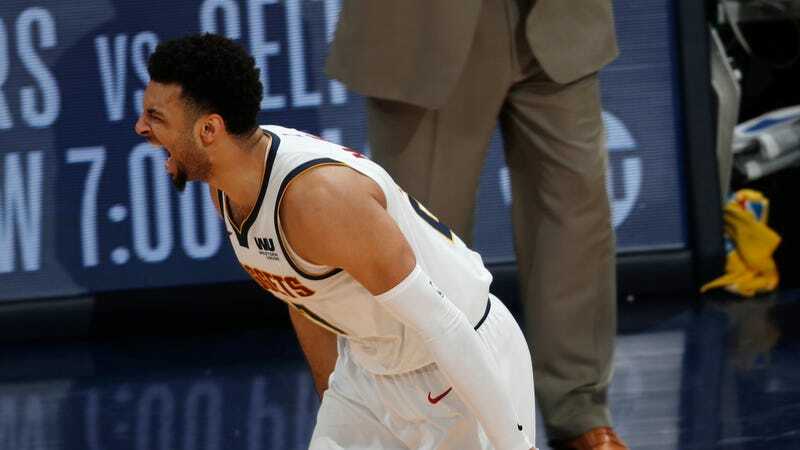 But, instead of having a terrific season on the verge of getting wasted with a first-round sweep, the Nuggets now have momentum back on their side with the series tied. In other words, Jamal Murray basically just saved the Nuggets’ season.